by domino - March 19th, 2019. 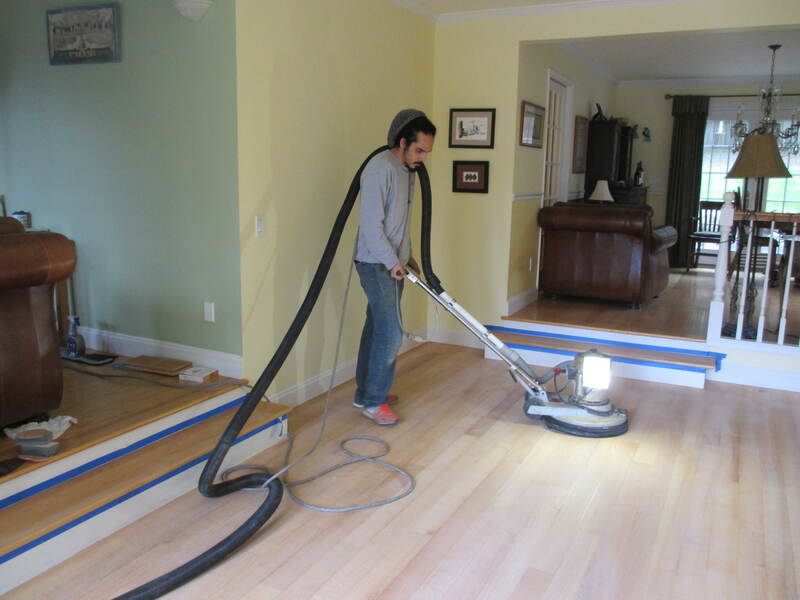 Thinking about sanding and finishing your wood floors? There has been a great deal of improvement in the equipment used for sanding wood floors. 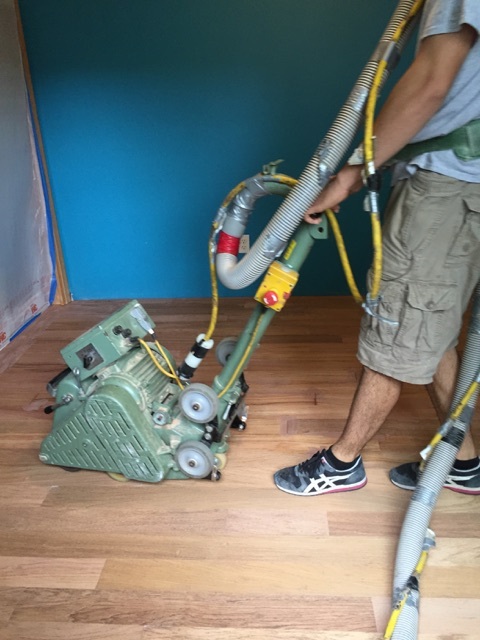 Twenty years ago, homeowners had to deal with all the sand that the machines would create while sanding the floors. Now we have dust containment systems that cause much less dust and lets you breathe easier (literally) in your home during the process. We use the Bona dust containment systems on all our machines, the drum sanders, the lowboys, and the edgers. 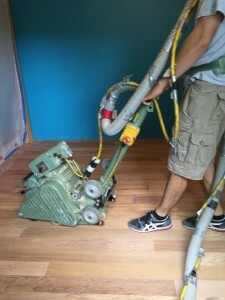 It is a system where you attach all your sanding machines to a vacuum and the sanding dust is sucked into the vacuum and not spread around your home. Drum sander with vacuum attachment. 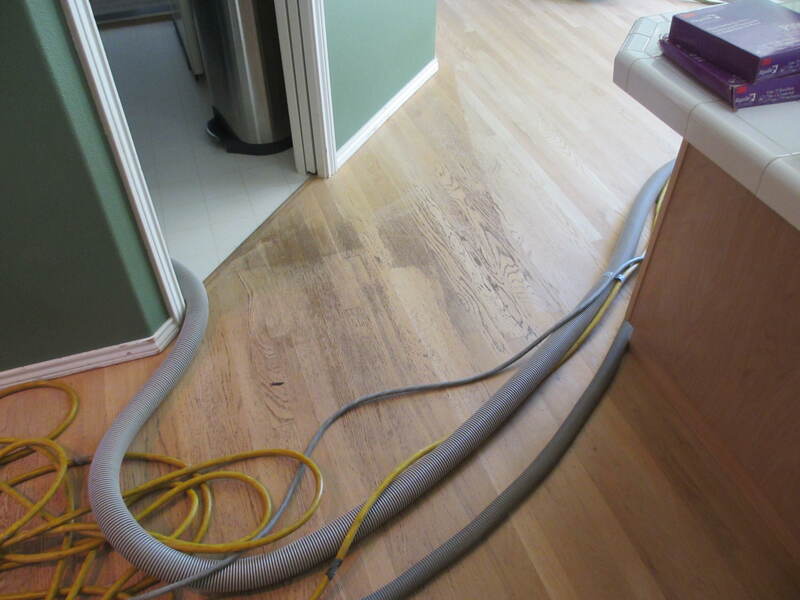 The hose is attached to a vacuum that is usually positioned away from the room being sanded (so the vacuum doesn’t have to constantly be moved). The hoses come if varying lengths so we can always reach every corner of the rooms. Just some of the cords and hoses that are needed. It really does make a difference, about 95% dust free. Where once you had to remove curtains, art work, chandeliers, and cover kitchen cupboards with plastic sheets, now the process is so much easier and cleaner. We had our kitchen re-sanded and finished and didn’t have to cover the doors to our cupboards with plastic – everything was fine after the crew was finished, thanks to the dust containment system. Please let me know if you have any comments or questions concerning this system. I’d be glad to help!